TARAWA, Kiribati, Sep 20 2013 (IPS) - Scientists say dredging, building causeways and natural climate variations are largely responsible for the flooding events that many officials here point to as evidence that climate change-induced sea-level rise is shrinking and destroying their tropical Pacific island. At the United Nations, in multiple climate change conferences and in an interview here, President Anote Tong, the world’s unofficial spokesman for low-lying coral islands in the Pacific and Indian oceans, often says that Kiribati’s 103,000 inhabitants are fighting a rising sea on a daily basis. “We’ve had a whole island disappear, a whole village has been evacuated, our freshwater is being contaminated and our crops are dying,” Tong told IPS in his office. He said his country was “on the front line of climate change”, adding that “time is running out” and emphasising the need for an evacuation plan. But in fact, a scientific study showed that the southern part of Tarawa, where more than half the country’s population lives, is far from disappearing: in fact it, it is growing. A series of what the scientists called “disjointed reclamations”, involving pouring dredged coral sand over shallow reefs to create land, increased South Tarawa’s size by nearly 20 percent over 30 years. Meanwhile, the area of the largely unpopulated north of the island remained stable (another study found similar stability in 27 other Pacific atolls). Tetabo Nakara said that he resigned as environment minister a few years ago because Tong had forced him to focus government policy on relocation rather than on mitigation through improved coastal management, which Nakara said was more appropriate. Climate scientists say the equatorial Central Pacific is the area in the world where the sea has risen fastest since 1950: 5.9 centimetres in just the past 20 years. That’s because an atmosphere warmed by heat-trapping gases like carbon monoxide and methane is in turn warming the ocean, and warm water takes up more volume than cold water. A second reason is that ancient glaciers in Greenland and Antarctica are melting, pouring fresh water into the sea. Tong’s adviser on climate change, Andrew Teem, regularly shows visitors examples of what he and Tong say is damage caused by rising seas. On a recent afternoon, he pointed to a breach in a seawall in the village of Eita, one of many around the island. Teem pointed to another locally iconic climate-change casualty, an island in Tarawa’s lagoon called Bikeman that was once dense with coconut groves. Today, it’s a barely visible pencil line on the horizon, a sandbank that disappears at high tide. The village of Tebunginako in the island of Abaiang, a 15-minute flight away, is also frequently mentioned as evidence that the sea is rising. Its inhabitants moved their 100 or so thatched huts and houses half a kilometre away from the shore after the sea washed away a sandbank that protected a freshwater lagoon, flooding some homes and making growing crops impossible. Countless climate change documentaries on Kiribati posted on YouTube show footage of waves crashing into houses during storms in 2005. But scientists who have studied Kiribati say these events have explanations that have little to do with climate change. 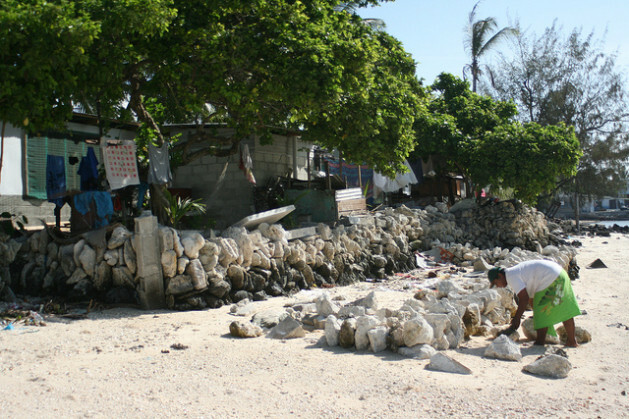 The seawall in Eita was built to protect a low-lying mangrove that was filled with dredged coral sand so it could be used for housing as more and more people moved into South Tarawa. But most seawalls are poorly designed and reflect the energy of the waves in such a way that these wash away the sand at the walls’ base, causing them to collapse. Bikeman Island disappeared because a causeway was built between two parts of the atoll, blocking a pass through which sand came in from the ocean side. Without this input, wave action slowly washed the sand away from Bikeman to other lagoon-side areas that saw their beaches grow. The village of Tebunginako asked for help to understand why erosion was so much worse there than elsewhere. Scientists reported here that a nearby pass had disappeared a century ago, again depriving the beach of fresh sand. The dramatic flooding of 2005 happened because of El Nino, a cyclical change in currents that moves warmer water east in the Pacific and is unrelated to climate change. El Nino caused the sea level in Tarawa to rise by more than 15 centimetres, says climate scientist Simon Donner of the University of British Columbia. That level hasn’t been reached since, he pointed out in a paper published in Eos, the journal of the American Geophysical Union. The Intergovernmental Panel on Climate Change’s latest assessment predicts a rise of anywhere between 25 cm and one metre by 2100, depending on carbon dioxide emissions.